4.2 The advancement of the arts, heritage,culture or science. 4.3 To extend, enhance and maintain a collection of social historic materials; preserve and restore other materials for the purpose of public display; and to carry out works for the improvement and development of the museum. 11 Membership is open to any individual aged 16 or over who support the objects and purposes of the Dalbeattie Museum. 13 Any person who wishes to become a member must sign a written application for membership; the application will then be considered by the board at its next board meeting. 16 No membership subscription will be payable. 24 A notice under clause 22will not be valid unless it refers specifically to the consequences (under clause 23) of failing to provide confirmation within the 28-day period. 34 At least 14 clear days’ notice must be given of any AGM or any special members' meeting. 38.2 sent by e-mail to the member, at the e-mail address last notified by him/her to the organisation. 40 The quorum for a members' meeting and/or AGM is 30% members, present in person. 50 A resolution agreed to in writing (or by e-mail) by all the members will be as valid as if it had been passed at a members’ meeting; the date of the resolution will be taken to be the date on which the last member agreed to it. 54.2 no more than 3 shall be charity trustees who were co-opted under the provisions of clauses 63and 64. 56 A person shall not be eligible for election/appointment to the board under clauses 58 to 61 unless he/she is a member of the organisation; a person appointed to the board under clause 63need not, however, be a member of the organisation. 61 At each AGM, all of the charity trustees elected/appointed under clauses 59and 60(and, in the case of the first AGM, those deemed to have been appointed under clause 58) shall retire from office – but shall then be eligible for re-election under clause 59. 63 In addition to their powers under clause 60, the board may at any time appoint any non-member of the organisation to be a charity trustee (subject to clause 54, and providing he/she is not debarred from membership under clause 57) on the basis that he/she has specialist experience and/or skills which could be of assistance to the board. 64 At each AGM, all of the charity trustees appointed under clause 63shall retire from office – but shall then be eligible for re-appointment under that clause. 65.9 he/she is removed from office by a resolution of the members passed at a members’ meeting. 66.3 (in the case of a resolution under paragraph 65.7or 65.8) at least two thirds (to the nearest round number) of the charity trustees then in office vote in favour of the resolution. 72 All of the office-bearers will cease to hold office at the conclusion of each AGM, but may then be re-elected under clause 70or 71. 76 The members may, by way of a resolution passed in compliance with clause 46(requirement for two-thirds majority), direct the board to take any particular step or direct the board not to take any particular step; and the board shall give effect to any such direction accordingly. 79 Provided he/she has declared his/her interest - and has not voted on the question of whether or not the organisation should enter into the arrangement - a charity trustee will not be debarred from entering into an arrangement with the organisation in which he/she has a personal interest; and (subject to clause 80and to the provisions relating to remuneration for services contained in the Charities and Trustee Investment (Scotland) Act 2005), he/she may retain any personal benefit which arises from that arrangement. 84 Any charity trustee may call a meeting of the board orask the secretary to call a meeting of the board. 86 No valid decisions can be taken at a board meeting unless a quorum is present; the quorum for board meetings is 5 charity trustees, present in person. 97 The minutes to be kept under clause 96must include the names of those present; and (so far as possible) should be signed by the chairperson of the meeting. 102 When delegating powers under clause 100or 101, the board must set out appropriate conditions (which must include an obligation to report regularly to the board). 103 Any delegation of powers under clause 100or 101may be revoked or altered by the board at any time. 105 Subject to clause 106, the signatures of two out of three signatories, who are not connected, appointed by the board will be required in relation to all operations (other than the lodging of funds) on the bank and building society accounts held by the organisation; at least one out of the two signatures must be the signature of a charity trustee. 111 This constitution may (subject to clause 112) be altered by resolution of the members passed at a members’ meeting (subject to achieving the two thirds majority referred to in clause 46) or by way of a written resolution of the members. 113.2 any statutory instrument issued in pursuance of that Act or in pursuance of any statutory provision falling under paragraph 113.1above. 114.2 “charitable purpose” means a charitable purpose under section 7 of the Charities and Trustee Investment (Scotland) Act 2005 which is also regarded as a charitable purpose in relation to the application of the Taxes Acts. Dalbeattie Museum (“we”, ”our”, “us”) respect the privacy of our members, friends of the Museum, donors, Trustees and website users (“you”) and we recognise the need for appropriate protections and management of your personal information. We have prepared this Privacy Notice to assist you in understanding what information we collect about you and how that information is used by us. To keep you updated about our work and keep you up to date about your membership with us. Contactual obligation (of your membership with us). If you are not a member, we will keep you updated on our work by post and by live telephone call based on our legitimate interests. We will only contact you by email with your prior consent. We will not be able to keep you updated on our work and your membership opportunities. If you are a Trustee, we need to provide this information to OSCR. Please contact us at 81 High Street, Dalbeattie DG5 4BT or info@dalbeattiemuseum.co.uk, as soon as possible after there is any change to your personal details, including your contact details. We will not share personal information with any other third parties without informing you beforehand, unless required by, or in connection with, law and / or regulatory requirements. The data that we collect from you will always be stored inside the UK . We will only hold your information for as long as you are a member, donor, friend of the Museum or a Trustee of the Museum. • where you have provided consent, to request to withdraw such consent at any time. Please note that if you choose to exercise your rights to have personal data restricted or deleted, then we may not be able to continue to offer you membership or keep you updated with our work. Dalbeattie museum has joined facebook. We hope you will enjoy visiting our page and keeping in contact with us. As our moto is " Not only to look back but to look forward", we feel we must keep up to-date with the world. We shall do our best to keep it up to-date. Telling you about our meeting and answering any questions you might have. Our first open meeting of 2015 was on Sunday 29th March and was very well attended with members and friends enjoying a talk by Capt Duncan Ferguson, who's talk was on the subject of James clerk maxwell from Glenlair. The meeting started with chairman Donald Henderson giving a quick report on what has happened in the museum over the winter months. The theme for this year main exhibition is to be about the local railway line called the paddy line. Donald spoke about dates for the 2015 Calander, such as our coffee morning on June 27 th in the lesser town hall at 10am and then the following day the 28th, there will be a talk in the church centre , Craignair street, with our speaker Mr Angus Rex , talking about the lost railways Of Galloway . This was then Followed by treasurer Mr bill brothwick giving a financial report. After the museum business then . Donald introduced Capt d Ferguson from Glenlair. Capt Ferguson gave a light hearted illustrated talk on the life of James clerk maxwell . After the lecture the members and friends had refreshments. Dalbeattie Museum Trust Limited held its recent Annual General Meeting in the Church Centre, Craignair Street, Dalbeattie where over 50 members and friends attended. Donald Henderson, Chairman, read out his annual report in which he thanked all the volunteers for their hard work and effort in making 2014 another great season for the museum. The comments written in the visitor’s book reflected good positive feedback and prove what an asset the museum is to the town. The website is now very popular and is viewed from as far a field as Canada and North America. The main exhibition this year related to both First and Second World Wars and was a great attraction to the younger generation who asked many questions about the exhibits. The Chairman also gave a resume of the work, which had been done to the museum roof, and the fitting of new security cameras. He concluded his speech with a report on the Christmas window display that the “Wednesday Club” had been working on. The main exhibition for 2015 will be on the history of the railway line that ran from Dumfries to Stranraer via Dalbeattie and was known locally as “The Paddy Line.” Next year will be the 50th anniversary of the closure of Dalbeattie station and its line. The museum is looking for donations of artefacts relating to the railway that can be loaned to us for the summer months to be displayed. Finally, two dates for your diary next year, the first being our next Open Meeting on 29th March and secondly, our Coffee Morning in the Lesser Town Hall, Dalbeattie on 27th June and we look forward to seeing you all at these events. Tommy Henderson becomes a Life President! Dalbeattie Museum has a new "Life President", Tommy Henderson accepted this position at the Dalbeattie Museum A.G.M. Donald Henderson becomes "Chairman", Donald is the son of Mr Tommy Henderson. Donald shall work along side his dad to share some of the responsibilities for the running of Dalbeattie Museum. Donald has helped his dad since the first thought of having a museum in Dalbeattie, but looks forward to his new position. A great buzz was in the museum on Saturday 30th March, as we celebrated the museum being open for 20 years. This is quite an achievement for a small town museum that is self funded. Donald Henderson gave a speech in appreciation not only to the loyal band of volunteers but to Tommy Henderson having the foresight to build the museum, when many people thought it would not work. Many visitors on holiday were encouraged to join in the celebration. In total 91 visitors had visited the museum on Saturday. A crowd of 55 watched as Chairman Tommy Henderson cut the cake. Tommy Henderson and Mr Stan Norman. Stan was a volunteer who helped build the museum 20 years ago and is Dalbeattie Museums oldest member at the age of 99. A great day was had by all and we look forward to the next 20 years! On Saturday 9th March, Donald Henderson welcomed Mr Willie Williamson from Birkenhead to our museum. Mr Williamson is the archivist for the Radio Officers Association. He came to the museum to personally hand deliver a Decca Navigator MK53. The Decca Navigator MK53 is a hyperbolic radio navigation aid for shipping. It is operated by measuring the phase differences between continuous signals from a master and slave stations. These differences were then related to a hyperbolic lines printed on a chart. Then your position could be found. Dalbeattie Museum is thrilled to add this navigation aid too its radio collection, and it shall be on display for our visitors to see. Dalbeattie Museum would just like to Thank, Mr Willie Williamson for his kind donation. On Saturday 30th March at 11am onwards, Dalbeattie Museum invites you to join us, in the museum, to celebrate 20 years since the museum threw open its doors and welcomed its first visitors. It was a wonderful day and many people came and supported the museum and the members had a feeling that the museum just might be a success. Thousands of visitors have come to see our collection and leave lovely comments in our visitors book like " Arrived as strangers but left as friends". Since that day we have written a book. This book was such a huge success, and the profits helped the running costs of the building. Second book was written by Tommy Henderson and was also a success. We sold items in a charity shop. We have done so much more, so come along to the museum on the 30th march and let us tell you our story! The Museum would like to "Thank" the members of the Wigtownshire Amateur Radio Club and Dumfries and Galloway RAYNET Group for making this event the success it was. Visitors to the Dalbeattie Museum on the 30th of September got quite a surprise when they discovered a party atmosphere. Most of the volunteers were there to celebrate with the chairman, Tommy Henderson and his wife, Phemie Henderson in celebrating their Golden Wedding Anniversary. Wine, cake and nibbles were available to all who attended, including the visitors. This event coincided with the "Day Of The Region", so the museum had a few extra visitors. Visitors numbers to the museum are again up from the previous year, taking the total this year to over 7000 people through the door. The "Titanic" exhibition has been a huge success, with visitors arriving from all over the world. The Museum will close its doors for this season on the 31st October 2012. Tommy Henderson (Chairman), would just like to take this opportunity to "Thank" each and everyone who has supported us in any way, and hope you will all come back and visit us again in 2013! On Saturday 11th August Dalbeattie Museum welcomed TV presenter Esther Rantzen through its doors. After such an exciting summer with the "Titanic Exhibition" bring many new visitors, this was the "Icing on the cake", for the museum. Esther arrived at 11am with her friend Mrs Ada Johnston along with Ken and Carolyne Miller. There was an exciting buzz surrounding the museum and the visitors who were already in the museum got a huge surprise when Esther walked in. Ada introduced Esther to Mr Tommy Henderson (Chairman) and to other volunteers who had managed to attend. Esther chatted to each and everyone of them. Tommy then gave Esther a guided tour of the museum. When they were looking at the display deplicting the granite industry , Mr Donald Henderson told her why the granite is so famous in Dalbeattie. Esther then proceeded upstairs to the main display area and she and Ada chatted about the dress that had brought then together many years before. After many pictures were taken Esther, Ada, Ken and Carolyne left as Esther had to judge the parade. Tommy Henderson said " This has proven to be one of the more interesting days in the museum this year and we would like to "Thank" Esther Rantzen for taking time out to come and visit our museum. It was great!". Dalbeattie Museum would just like to "Thank" Suzanne Baxter for letting us use her photographs. To read why Mrs Ada Johnston and Esther Rantzen became friends then go to our Stories pages and click on Ada Johnston, The Big Time. On Saturday 11th August 2012, Dalbeattie Museum at the last minute decided to put an entry into the parade. This was to promote the museum and remind visitors to go and see the museum while in Dalbeattie for all the civic day events. Mr John Wilson of Jas P Wilson, very kindly gave us the loan of his 1956 Morris Minor. It turned out to be the best parade Dalbeattie had seen in a long time and may have been due to the wonderful weather that day, as it was warm and sunny. Tommy drove the car through the parade and said " It was great to see so many people enjoying themselves", Tommy also enjoyed driving the Morris, as he had one many years ago. On Saturday 14th April the museum opened its doors at 10am and the first visitors through the doors were given a boarding pass, as if boarding the ship "Titanic". Throughout the day refreshments were offered along with nibbles. Entering further into the shop area children could have their picture taken at our reconstructed "Titanic Ship", re-enacting the scene from the film with Leonardo and Kate Winslet. This was a great hit. Graeme Henderson was then in-charge of printing out these pictures and handing them over as a souvenir of their visit. Another popular item was a badge that Dalbeattie High School had produced, which has the White Flag deplicted on it. This badge costs £1:50. The Wigtownshire Amature Radio Club and Dumfries and Galloway RAYNET were using GB100MUC callsign over the weekend to commemorate RMS Titanic's 100th Anniversary and to William McMaster Murdoch, who was born in Dalbeattie on the 28th Februrary 1873. William Murdoch came from a seafaring family and rose to the rank First Officer with the White Star Line. William McMaster Murdoch was on the bridge of the Titanic as the ship hit the iceberg. The two radio groups had a great weekend having had over 1000 hits from other amature radio individuals from around the world. Much more information on the Wigtownshire Amature Radio Club can be found on www.gm4riv.co.uk or www.dgraynet.co.uk or www.qrz.com to see the calls we recieved. At 6pm the volunteers closed the doors, having welcomed over 210 visitors. Sunday 15th April was another repeat of the day before and when the doors closed at 5pm another 105 visitors had came to see our Titanic exhibition and our other displays. Dalbeattie museum had had a great weekend and it was nice to see the museum full to bursting with visitors. Tommy Henderson chairman of Dalbeattie Museum would like to take this opportunity to Thank each and every visitor for attending but also to Thank his loyal band of volunteers for their continuing hard work and dedication to Dalbeattie Museum and for making the "Titanic Weekend" such a huge success. A surprise of the day was a visit from a direct relative of William McMasterMurdoch, who had travelled all the way from Liverpool. The name Ernie Robinson will be known the whole world over through his passion for all things that had a connection with the sea. Especially Ernie's huge interest in all that sailed on the Solway Firth. Ernie was a lecturer at one time in Penrith. He had a holiday home called "Victory Cottage" in the village of Portling in Dumfries and Galloway. This was where Dalbeattie Museums President Mr Tommy Henderson was to first meet Ernie, as he had required an electrician to do some wiring at the cottage. This is almost 45 years ago and they became close friends ever since. Tommy Henderson was encouraged by Ernie to start his Museum in Dalbeattie, even though Ernie never took an active part in the building of the Museum he was always in the background. His knowledge of local history especially local ships and their captains, where and when each ship was built and even to how much they cost. He spent hours in London researching out information from Maritime records. All copied by long hand. Ernie was a perfectionist especially if a wrong date appeared in type, as Tommy has found in the books which were gifted to the Museum. The Museum now has the most comprehensive collection of facts and figures appertaining to the sailing vessels that frequented the Solway Firth and the River Urr, when the boats came up as far as Dalbeattie Harbour. Ernie will be sadly missed by his friends and acquaintances in Dalbeattie Museum. 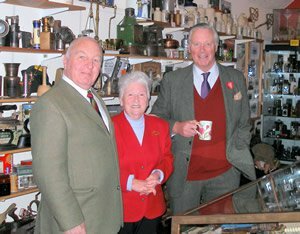 The Lord Lieutenant of this district Sir Michael Ross on this annual tour of Dalbeattie visited our museum. He was met by the Chairman Mr Tommy Henderson who in turn introduced him to most of the volunteers that help run the museum throughout he year. This was the first time in 20years any official visit to the museum had taken place. He was most impressed with what he saw. He wished us every success in our new venture, and hoped the new extension to our premises would encourage lots more visitors this coming year. After coffee and biscuits he thanked everyone and congratulated the trust on the enthusiasm and dedication of its members to achieve a museum of such a high standard and to the preservation of all that Dalbeattie had added to the economy of the District in the past. His last remark was "I will be back!". Dumfries and Galloway Life magazine held its first awards ceremony to reward unsung heros in our area at Easterbrook Hall at the Crichton on Wednesday 10th November. 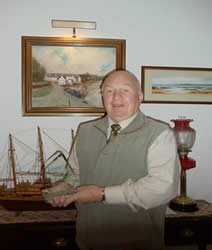 It was at this ceremony that Tommy Henderson our founder and Chairman of Dalbeattie Museum was awarded the Community Champion Award for his life time dedication to the town of Dalbeattie and Dalbeattie Museum. Tommy said " It was the biggest surprise of my life that they chose me!". What made this award even more special was that it was sponsored by The Glasgow Association, who are no strangers to the Museum and the work that Tommy does. Tommy revealed that it gave him great pleasure to think that people in the area thought so highly of him. The Crystal Trophy stand proud in his house as a reminder of this happy occasion. Tommy would also like to take this opportunity to say a huge Thank You for who nominated him and to say no one could appreciate the award more than him! Only a few weeks ago the Museum became the custodians of 13 bound Gallovidian Annuals from Rory Callan, Mr Ivie Callan grandson. these have been given to the Museum on a long term loan but they will be a great source of information for our visitors to refer to for local information and history of the area. On Tuesday the 7th Of July 2009 in the Town Hall, Dalbeattie. Dalbeattie Museum was officially presented with their Queens Award Certificate and Commemorative Crystal Ware for Voluntary Service, from Lt. Col. Sir Malcolm Ross, GCVO OBE. The introductions were done by Mr. Derek Crichton, Area Manager for the Stewartry. Followed by Mrs. Jean Farish who gave a small speech about how the museum had received the award. Next the presentation, where Tommy Henderson, Chairman, received the certificate and Crystal Ware from Lt. Col. Sir Malcolm Ross. Mr. Tommy Henderson then replied on behalf of the volunteers with a speech thanking everyone for this huge privilege bestowed on them. Shortly after Mr. Tommy Henderson gave a presentation on the history of the making of Dalbeattie Museum. A Buffet and light refreshments finished off the exciting evening. 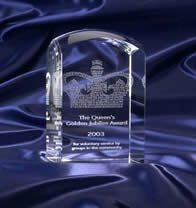 Dalbeattie Museum's voluntary members were awarded this highly prestigious award on the 2nd of June 2009 as a recognition of all their hard work over the last 16 years. Tommy Henderson said on receiving the news of the award "It is really wonderful that the museum and the people of Dalbeattie have been recognized for all the hard work that has gone in over the years" the award will be presented by the Lord Lieutenant of Stewartry on a later date and four members of the museum trust have been invited to the Queens garden party at Holyrood House in Edinburgh.